Many years ago, I began my journey in mixed media creating what we used to call Altered Books. This experience of creating works of art from old books was quite liberating for me – bringing new life to old, boring books by creating shrines, hidden pockets and almost anything my mind could imagine for making a work of art. Fast forward to last year, when I was asked to create a project for the Wanderlust online series of classes. I wanted to share my love of book reconstruction, mixed with assemblage to share with students a mixed media masterpiece that they could use for creating their own bookmaking projects or adapt to other works of art. For this particular project, I used a larger format book that was a gardening reference journal. The inside of the book would hold the shrine. Reconstructing books takes on a variety of different techniques for building the final project, dictated upon how the final function and look of the book. With this project, I began by using a gel medium for adhering the book block together along all edges of the pages. I like to use painters tape to hold the book block together while it’s drying so that I can begin carving out the shrine while the drying process happens. I’ve found that in my experience, adhering the book block together first allows for easier cutting of the shrine. 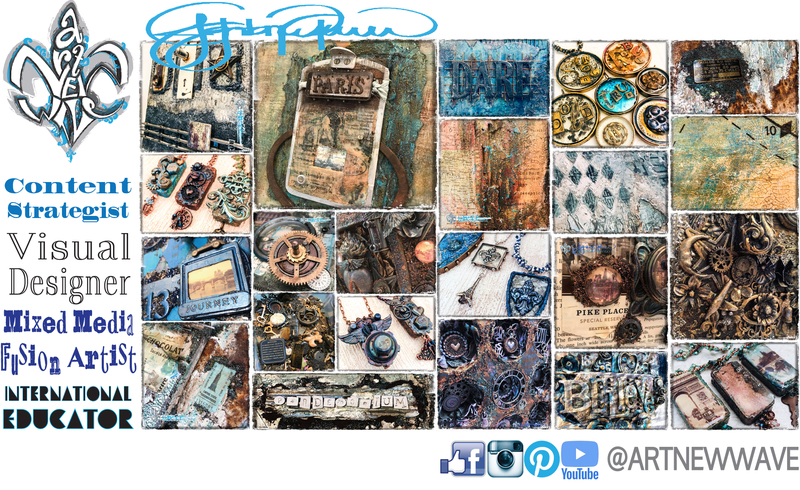 The base color and texture that I used for this assemblage was created using Brown Rust Paste, with highlights of Patina Blue Paste. I blended the two colors while they were still wet to create a moss green color, then heat set before adding more Patina Blue. On the front cover, I added a wooden box from that was filled with sculpted fabric for the background of the window frame. Here is a close up of the texture paste base that I created, showing the depth and texture that can be created. For more texture around the window box in the middle of the cover, I added Art Stones by adhering them with the rust paste and then colored them at the same time as the rest of the book cover. There are so many different ways to add additional texture to a project and I’ve found using the Art Stones is a quick and easy way to achieve this. Next I began coloring all of the embellishments that I would be including into the collage with a base coat of heavy black gesso. I then began layering Metallique Colors (Blackberry, Steampunk Copper and Blue Waters) with highlights of rust and blue mica powders. Once I had the desired colors, I incorporated these same metallic colors onto the book covers and pages. The inside of the book features the carved shrine from the book block, layered and collaged with found objects and other embellishments. The inside cover and front of the book block was colored with metallic paints and mica powders on top of the texture I created earlier. I used one of my favorite stencils to add a harlequin pattern with additional texture paste colored with Steampunk Copper that coordinates beautifully with the collage elements. As with many of my reconstructed book projects, I feel that it’s essential to allow some of the the original text and/or pages from the actual book to be seen somewhere in the work. For this project I felt that it would be the perfect background to the collage inside of the shrine. Layered inside of the shrine is a pocket watch that I created with some antique gears, ephemera and mica flakes. All of this was created with multiple layers of ICE Resin to give additional depth to all of the elements incased inside of a pocket watch that was used as the bezel. When working with multi-dimensional collages, I feel that the details found within the elements allows the viewer to always find something new each time they view the piece. An antique button still attached to the original piece of vintage denim in the top corner of the collage adds a piece of history to the collage. Beneath the glass bauble is an antique skyline image, resting on top a piece of an upcycled coffee bag from my home town of Seattle. Slight touches of texture created with texture pastes, highlighted with glass glitter and micro beads adds another dimension to the collage, while at the same time harmonizes with colors and textures found on the surrounding book page. Using touches of texture and color allows them to become another ‘piece’ of the collage while at the same time not overpowering the found objects. The front cover of the book features a variety of found objects, carefully layered and assembled to tell it’s own story. Like the inside of the book, there are so many details found within many of the elements. To offset the objects and inclusions from the background colors, I chose to use metallic blue paints and mica powder with a touch of copper mica to highlight the elements while also pulling out more of the individual textures and shapes of each of the objects. This attention to detail and harmonious color is carried over the spine of the book to the back cover. The spine features paper clay pieces that have been colored with the same metallic paints and mica powders. On the back cover to the book, I used the same stencil that was used on the inside cover to carry over the pattern to the outside of the book as well.